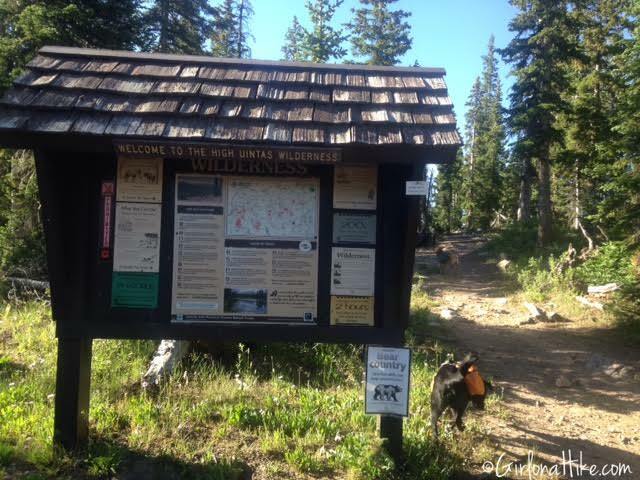 Our group decided to head in via the Highline Trail starting from Hayden Pass. 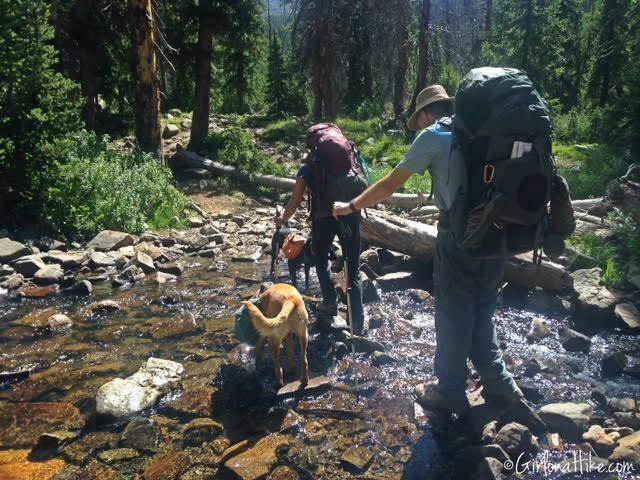 This would be a 10 mile hike into our chosen lake, bypassing the Naturalist Basin trail split, and crossing over Rocky Sea Pass. Many of the lakes pictured here will not be named, so as to keep them relatively secret. It's too beautiful of an area for it to be trashed, and I fear that some of these lakes will one day become over populated. 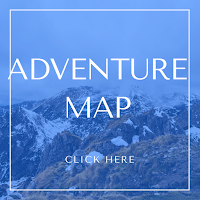 However, if you have a map and do a little research and route finding, you can find your way. 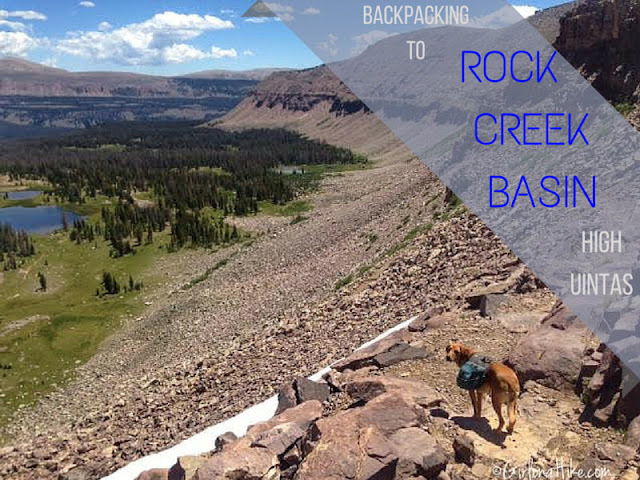 Rock Creek Basin is so large that it would be hard to see every lake, and in the two nights we spent in the basin, we only saw 8 other backpackers. Starting out on the Highline Trail, you will see literally hundreds of people, mainly boy scouts. 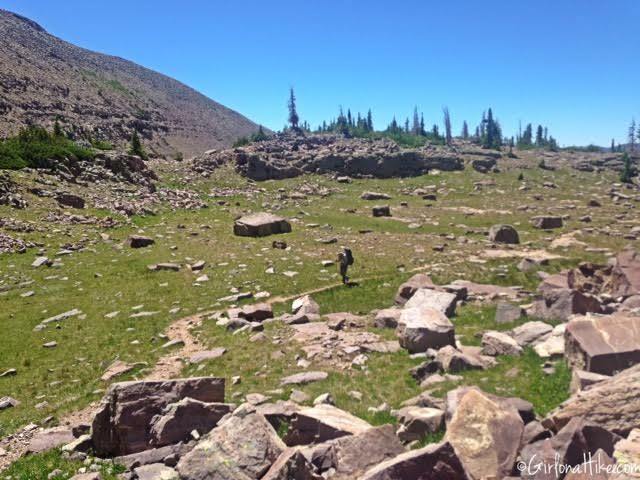 This is because Camp Steiner is just down the road from the TH, and Naturalist Basin (only 7 miles in) is a popular and "easy" backpacking destination. 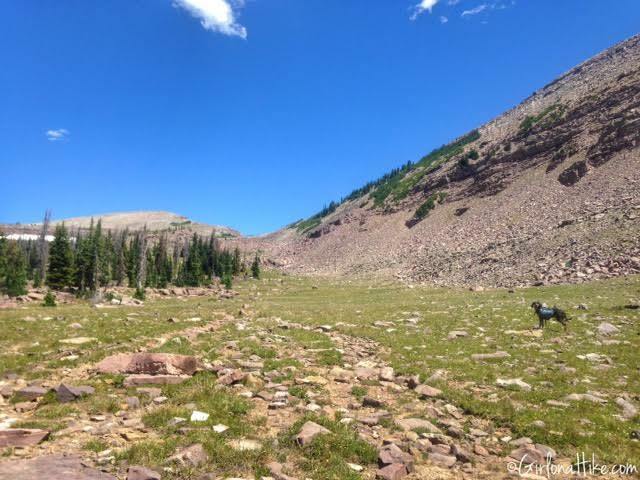 However, once you get past the trail split for Naturalist Basin, you will see very few people. Not only will you see hundreds of people on the Highline Trail, but also llamas, goats, and horses, helping to transport gear and goods. Stock animals always have right away on trails. 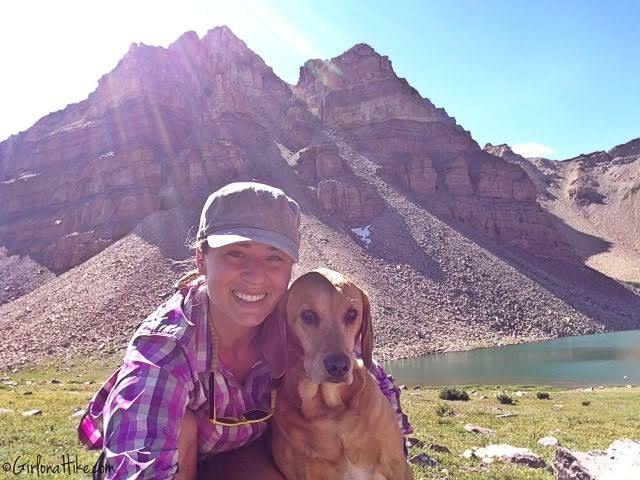 Many people ask, "Can I bring my dog into the Uintas?" and the answer is YES! 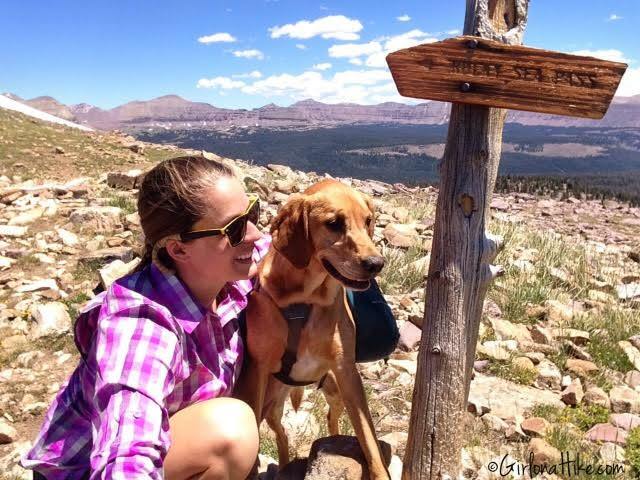 Dogs must be leashed in parking lots, and developed areas (such as campgrounds), but can hike off leash on all trails. Poop must be picked up and packed out. I recommend bringing a ziplock back to store it in to keep the smell at bay. 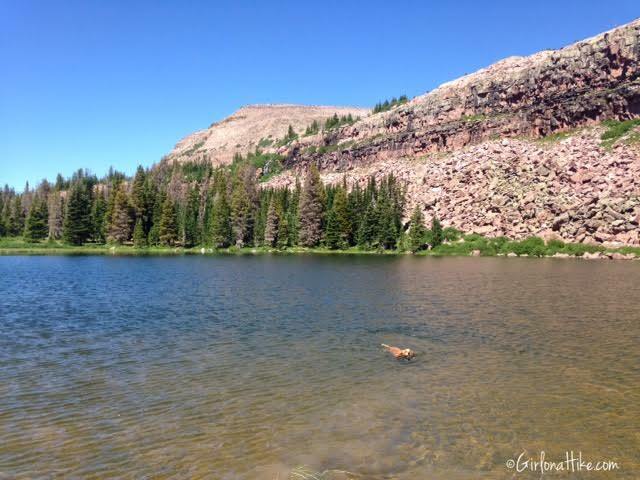 I love backpacking with Charlie in the Uintas - he has a blast running on the trails, swimming in the lakes, and being able to run free around camp. 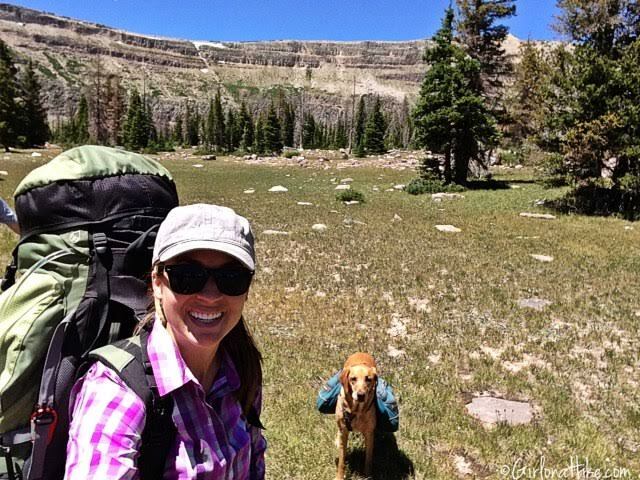 See my post on Backpacking with Dogs for some basic Do's & Don'ts. 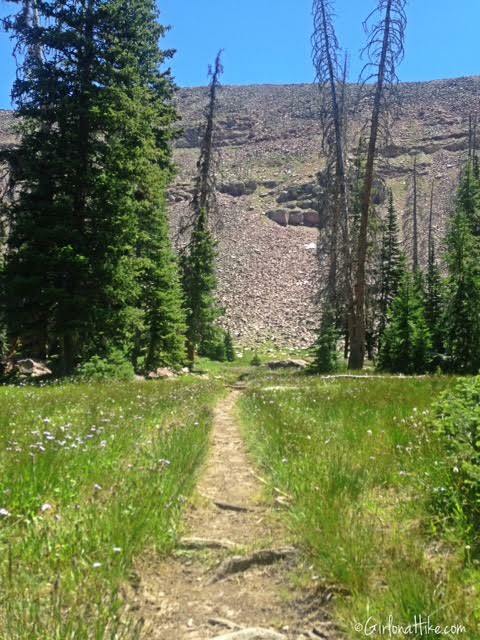 The Uintas are only about 1.5 hours away. From SLC, head East on I-80 through Parley's Canyon. Take exit 146 for HWY 40 south, then exit 4 towards Kamas, UT. At the first stop light, turn left, and at the next stop light (at the Chevron), turn right. You'll now be on the Mirror Lake Highway. 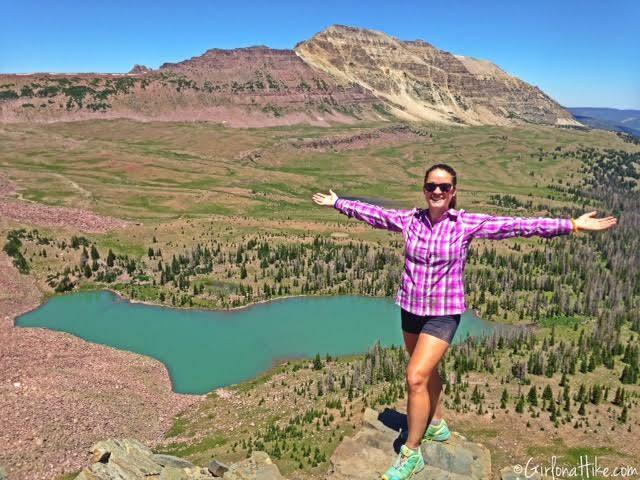 Drive for 34 miles until you reach the Highline Trailhead at Hayden Pass on your right. There are restrooms available. 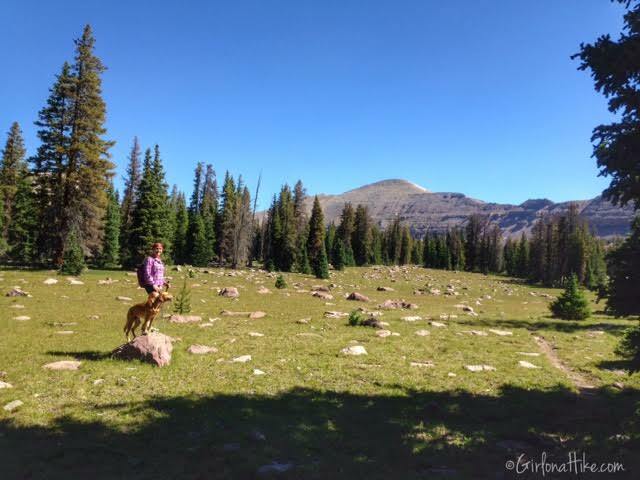 Welcome to the High Uintas Wilderness! The Highline Trail starts out heading south for about 10 minutes, then will turn East for the rest of the trail to Rocky Sea Pass. 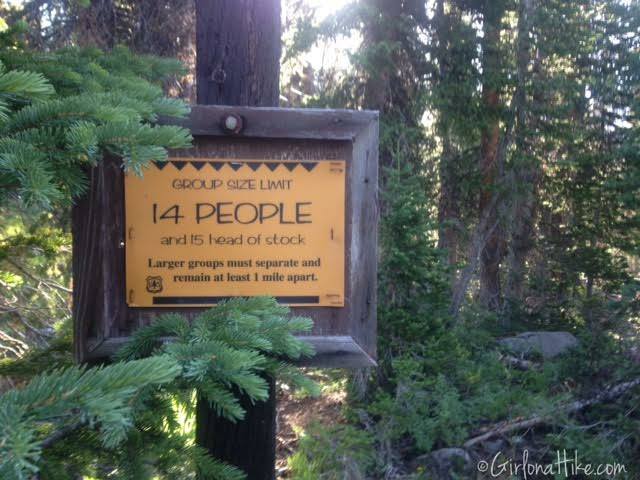 Group size is limited to 14 people, and 15 head of stock. 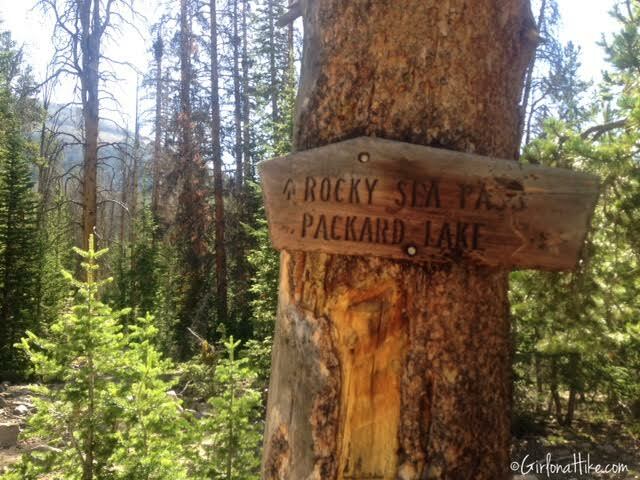 Follow the signs for Rocky Sea Pass, which is 8.5 miles one way from the Highline TH at Hayden Pass. Charlie is ready for a big day of hiking. 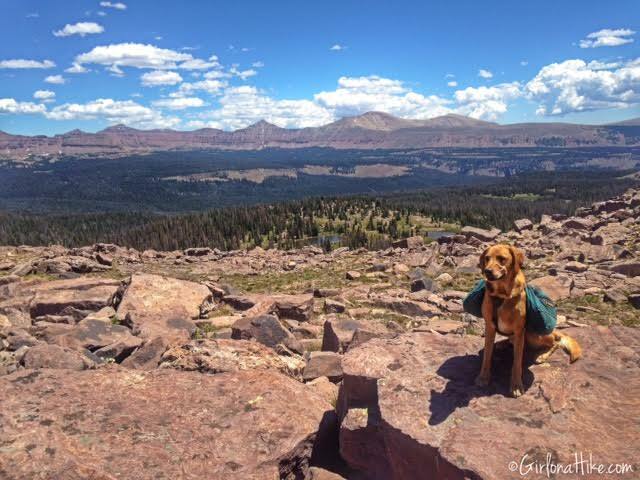 Since there's plenty of water in the Uintas for him to drink from, all he needs to carry is his food, a bowl, and leash. I keep everything in his pack in ziplock bags because he likes to swim with his pack on, and I don't want his gear to get wet. For really cold nights, Charlie will also carry his Quinzee Coat. 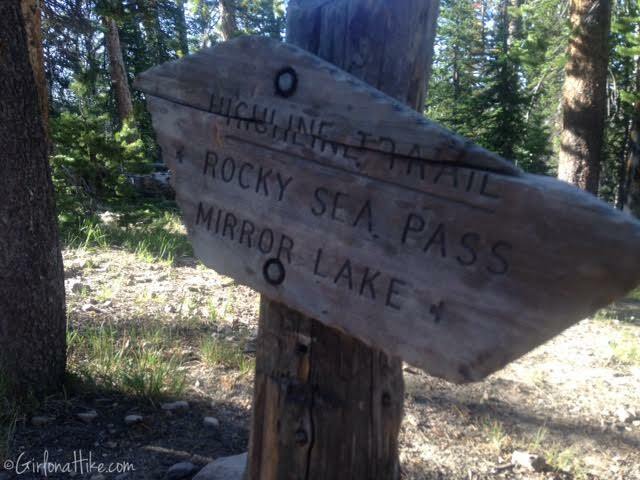 You will see many trail splits, but just keep hiking towards Rocky Sea Pass. The Highline Trail is very wide and alternates between very flat and very rocky. 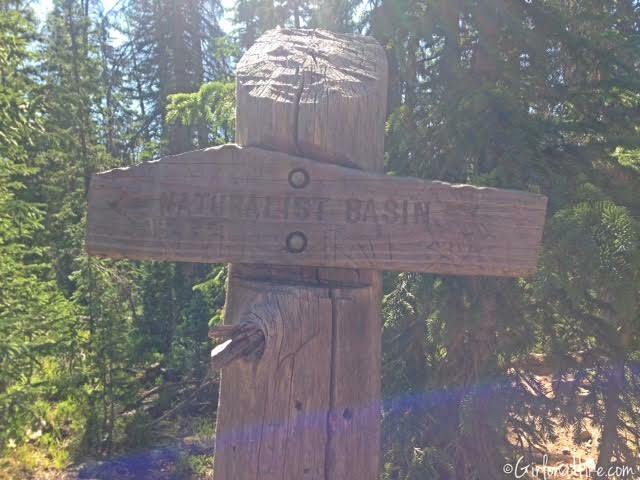 At roughly 4 miles, you will see the Naturalist Basin trail split. 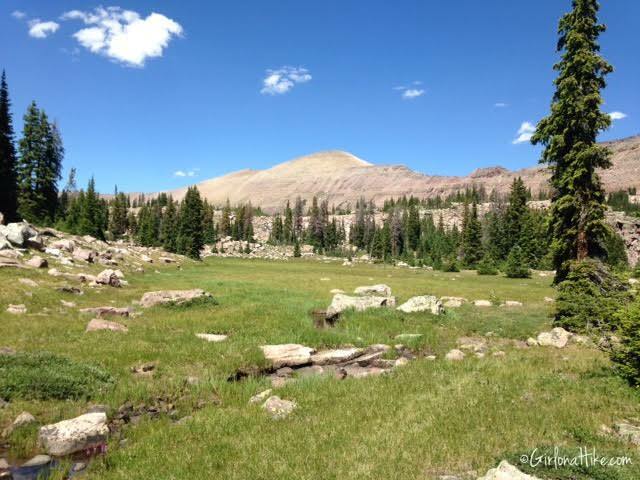 This is another great area of the Uintas explore, but is best done as a separate backpacking trip. 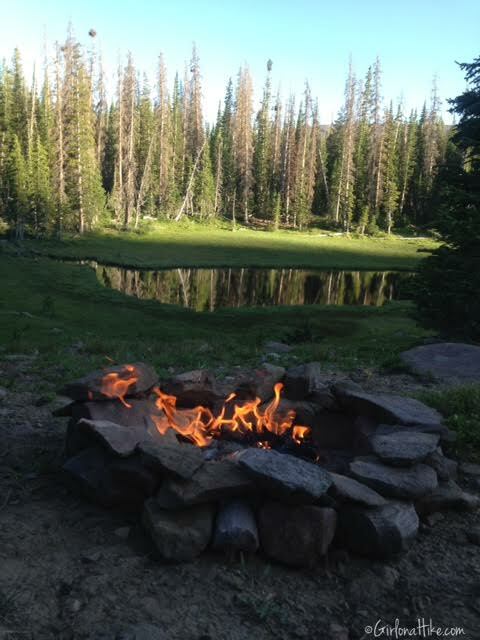 There are several lakes to camp and fish at, however, you will see a lot of people camping in this area. 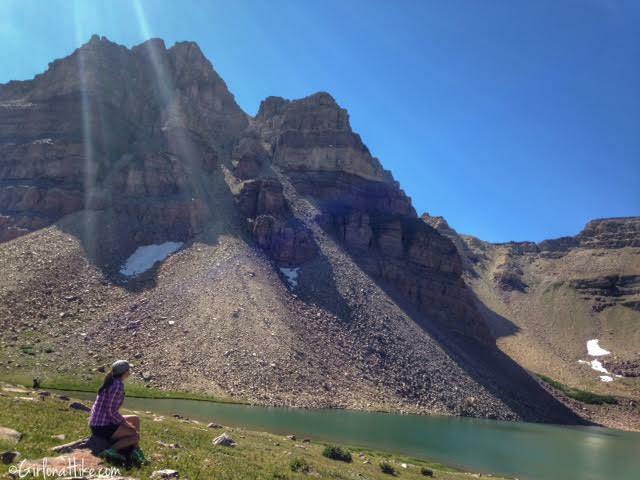 Blue Lake is my favorite, and Mt. Agassiz can be summited from that lake. You will cross two large creeks. 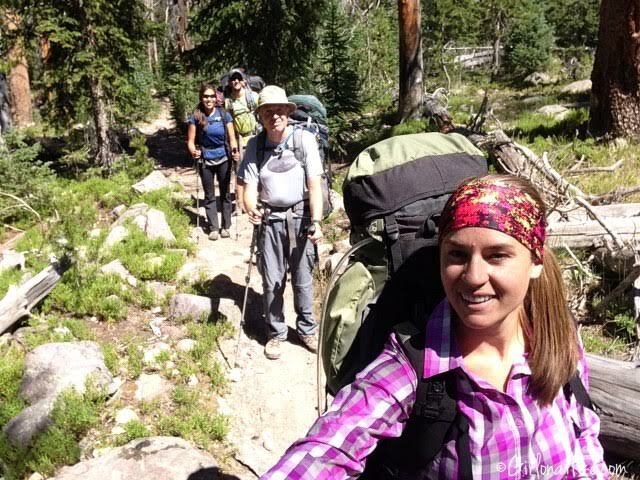 Having trekking poles will help with balance, especially with a heavy pack on. 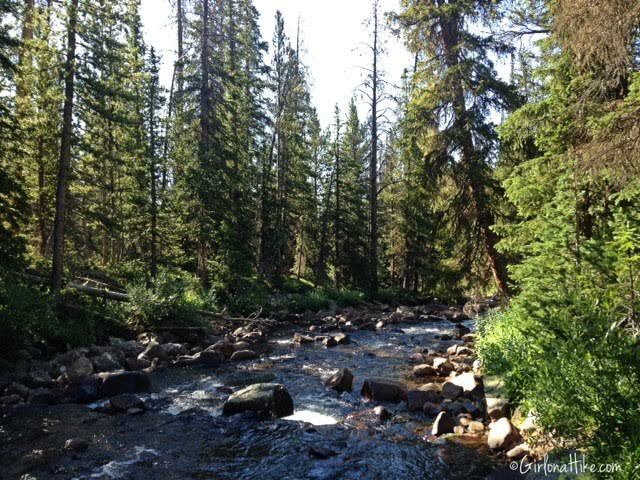 If you happen to run low on water, these two creeks are great to filter water from. This trip I wore my "Marathon" FitnessFox Headband. 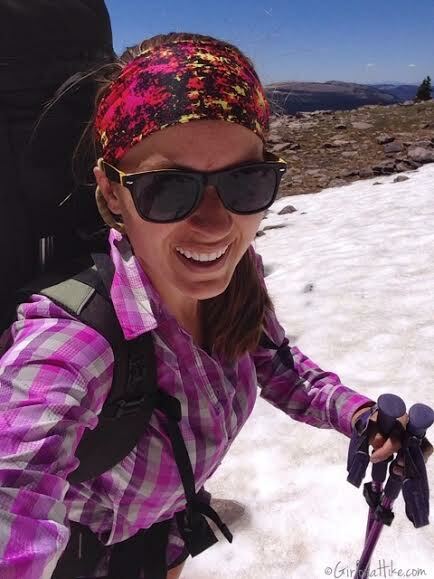 I absolutely love these headbands for backpacking! The pack leads the way! On this trip we had Charlie (my Golden Lab), Jax (Black Lab Mix), and Copper (Blue Tick Hound). 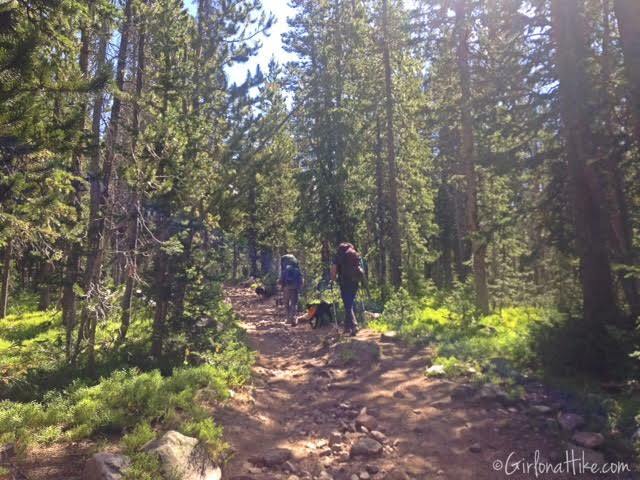 All of the dogs have their own pack, and did a great job on the trail together. 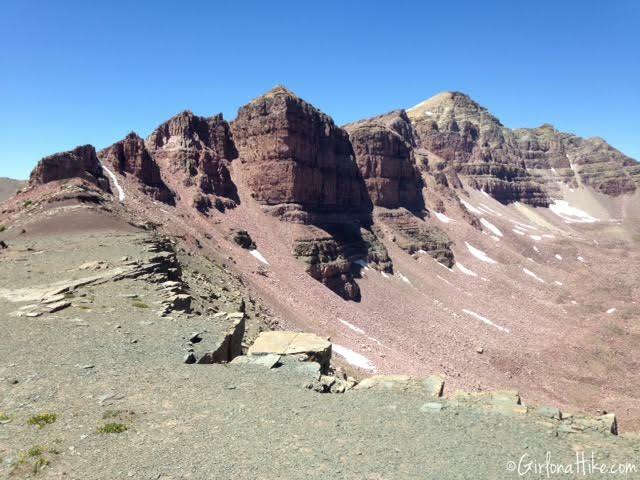 Finally, after about 4 hours, we had sight of Rocky Sea ridgeline. 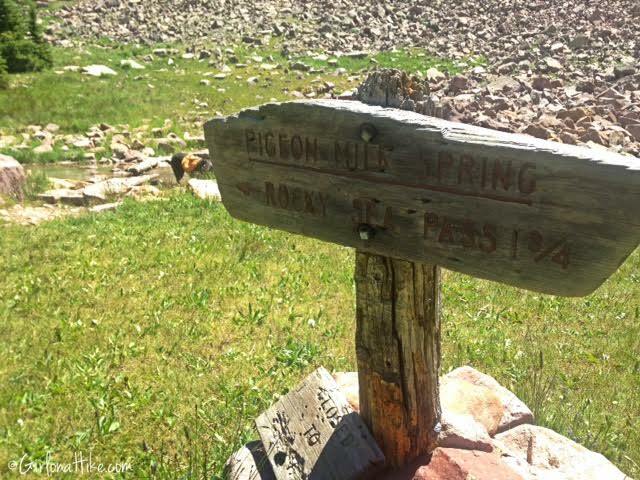 The trail crosses over Pigeon Milk Springs - another great source of ice cold water to filter! 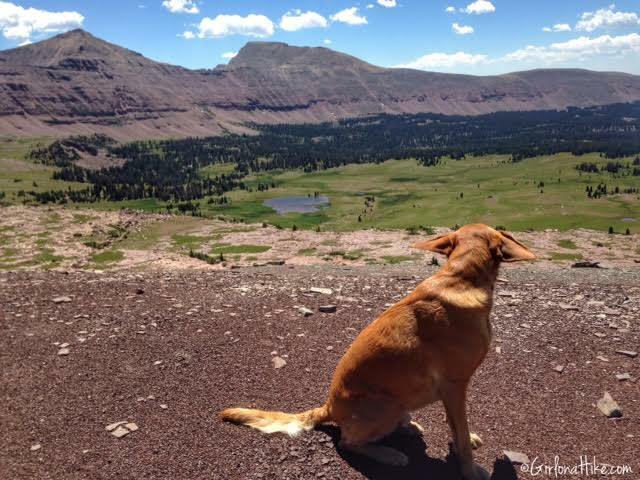 Once we started working our way up higher to the pass, the wind was stronger, and make Charlie's ears fly! 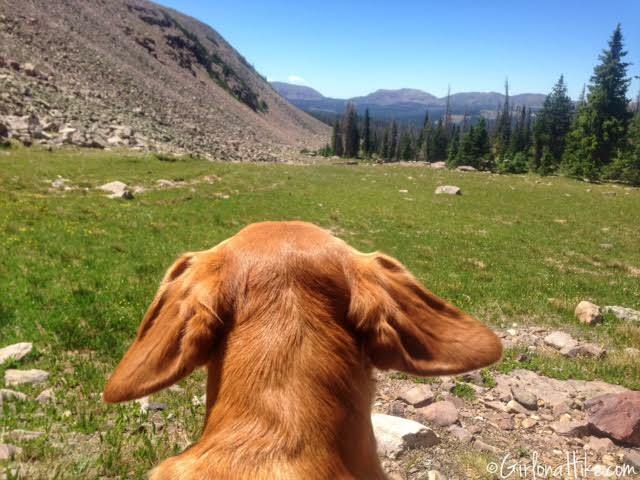 Nothing like the wind in your hair...or, ears! 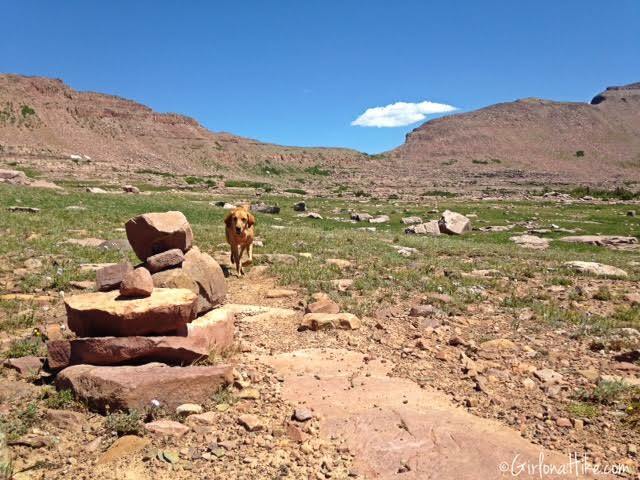 Copper leads the way to the pass. This area was so pretty! 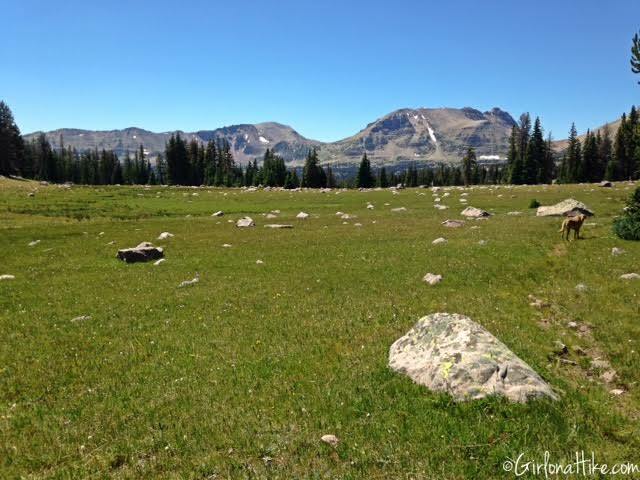 Even in the middle of July, you can find snow patches around 11,000 ft. Keep in mind that when you are hiking at this high of an elevation, you'll want plenty of sun protection. I just bought this shirt from the Columbia Outlet in Kimball Junction, UT. You can also find them on Amazon! I initially felt a little nerdy wearing this simply because of the collar and long sleeve. I thought ,"Aww man, am I turning into one of those hikers?!" But OMG, this is one of the best shirts out there! It's super light weight, has the Omni-Shade protection (UPF 30), consists of moisture-wicking material (53% Silver Ridge Nylon and 47% Tactel Nylon Ripstop), has two air ventilation areas on the back, and it feels like I'm not wearing anything! I never felt hot wearing this while backpacking, even though the day time high was around 75F. I don't care if I look nerdy now, I freaking love these shirts. Back to the trail info...Dave makes his way through the small meadow to Rocky Sea Pass. We made it to Rocky Sea Pass in about 5 hours (we were moving slowly at a 35 min/mile pace). 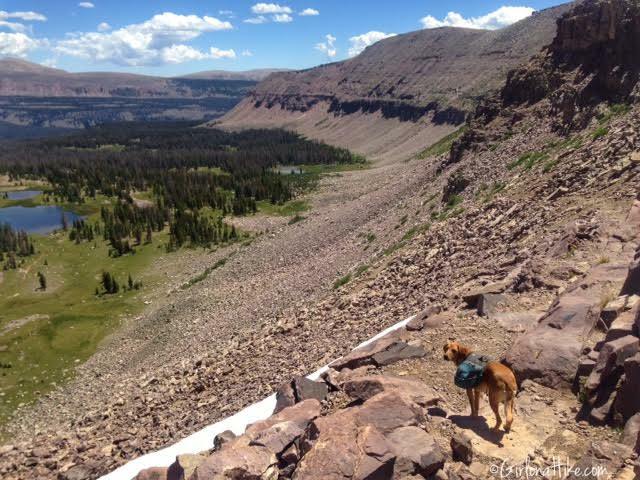 Looking into Rock Creek Basin! 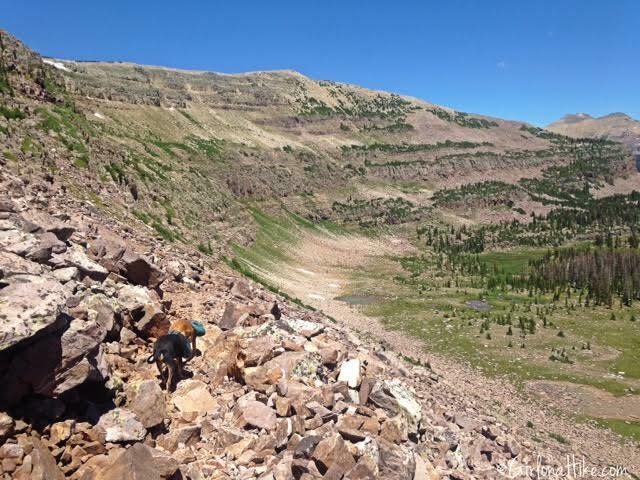 After taking a longer break to snack, we started down the steep switchbacks into Rock Creek Basin. 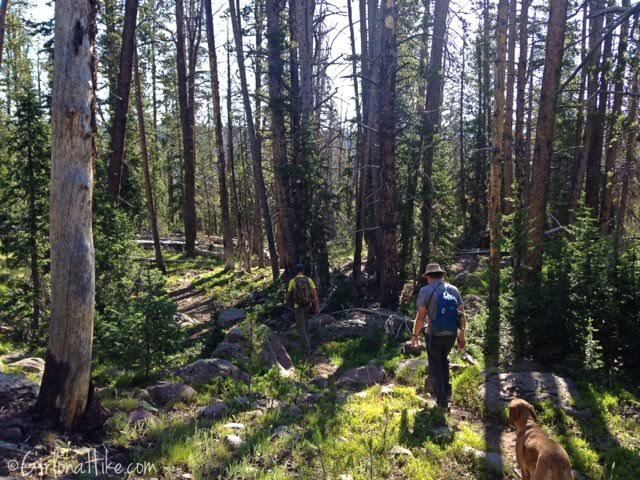 Making our way past the first few ponds, on a nice flat section of trail. We made it to the lake we camped at (which will remain un-named) in about 6 hours. Home sweet Home for two nights. We started a fire and enjoyed relaxing. The mosquitoes weren't really that bad - only in the morning and evening is when they came out to play. 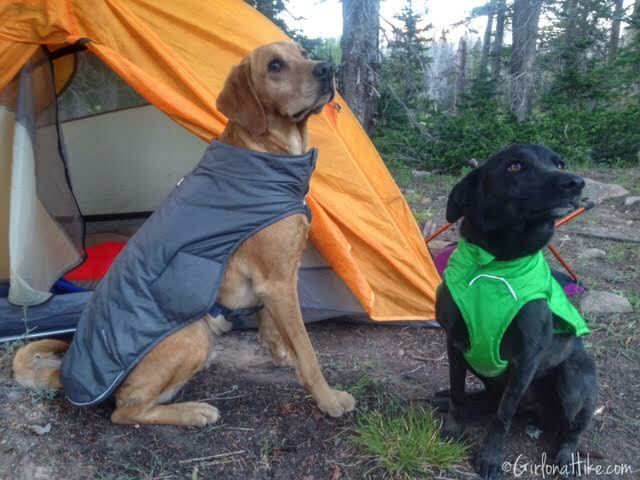 Charlie and Lucas, the Mexican Mutt, both put on their Quinzee Coat and were ready for bed. 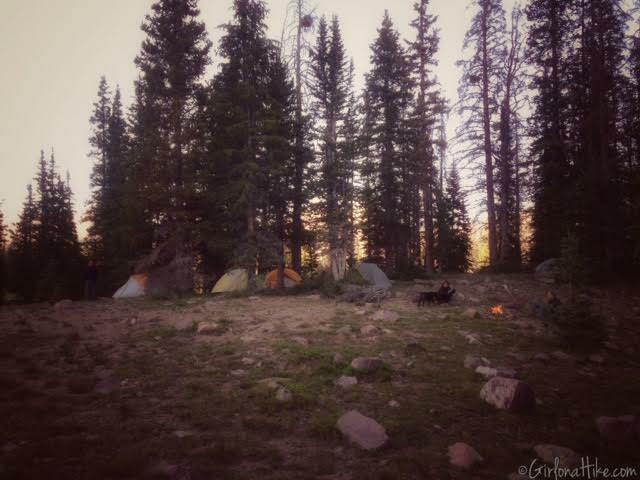 On day 2, we swapped our backpacks for day packs, each of us using our REI 18 Flashpack. 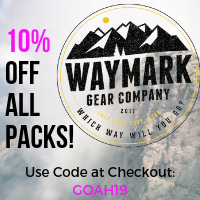 These are great to bring along for backpacking trips, so you can use a much lighter pack for your day hikes. At only 10 oz, it fits nicely into any backpack. 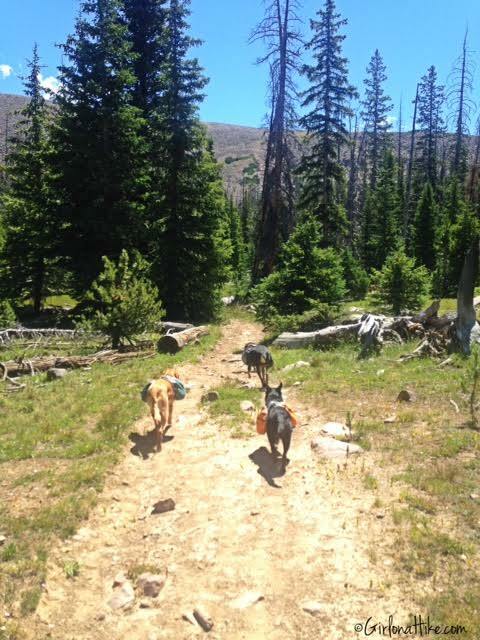 The dogs left their pack at camp, since they didn't need anything besides water, which they could find on the trail. 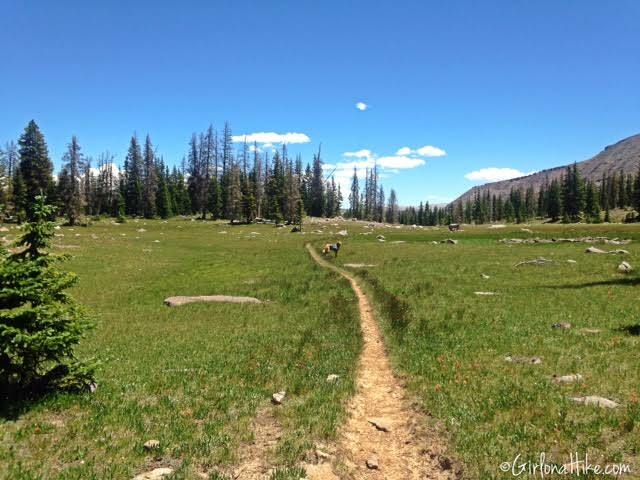 Rock Creek Basin is filled with many beautiful meadows. 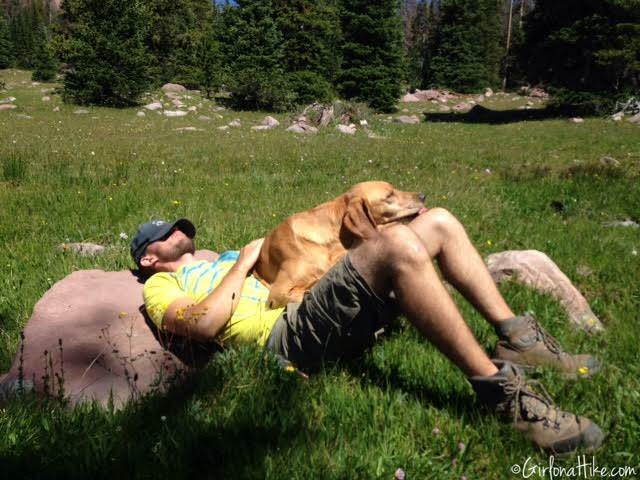 Byron and Charlie take a nap - by this point we had hiked 3-4 hours. We had no where to be in any time frame so we took our time the whole day. 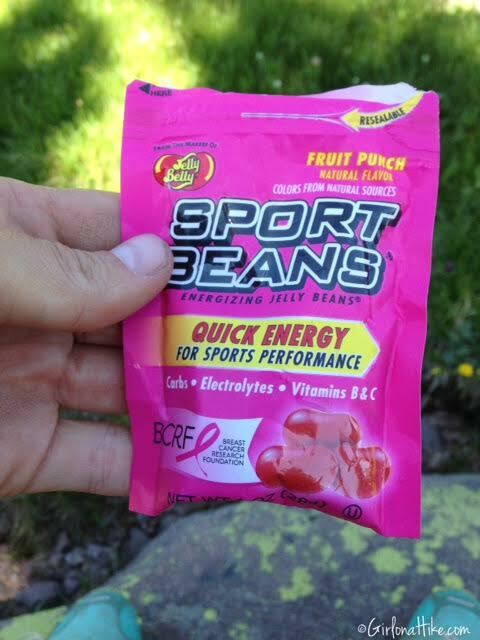 Snack #1 - Sport Beans ($2ish at REI). 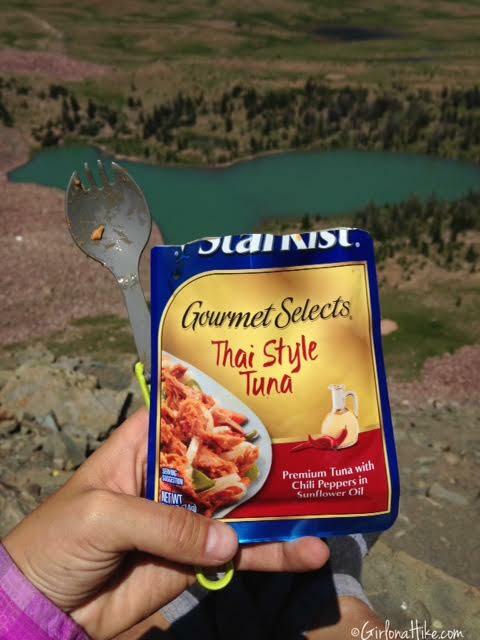 I don't usually eat the whole pack at once, I use them to get the spitty taste out of my mouth and to provide a little energy as I hike throughout the day. I use to use ShotBloks but can't stand the texture of them, so I switched to Sport Beans. Charlie takes a swim to cool off. Working our way up to Dead Horse Pass. Panorama on the way to Dead Horse Pass. At Dead Horse Pass! 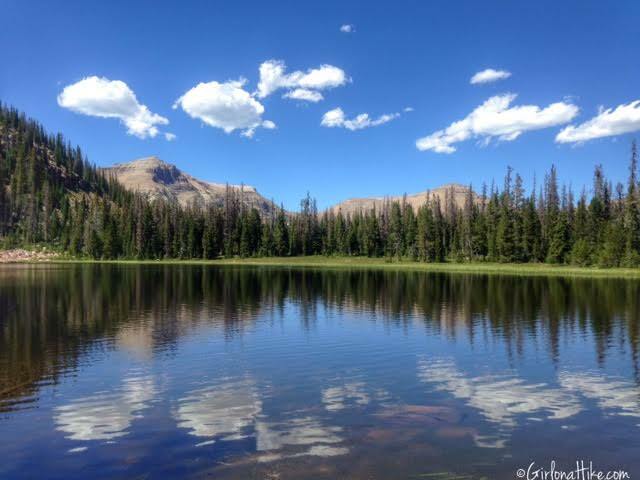 This is my new favorite view in the Uintas! We could only see one tent down at the lake. 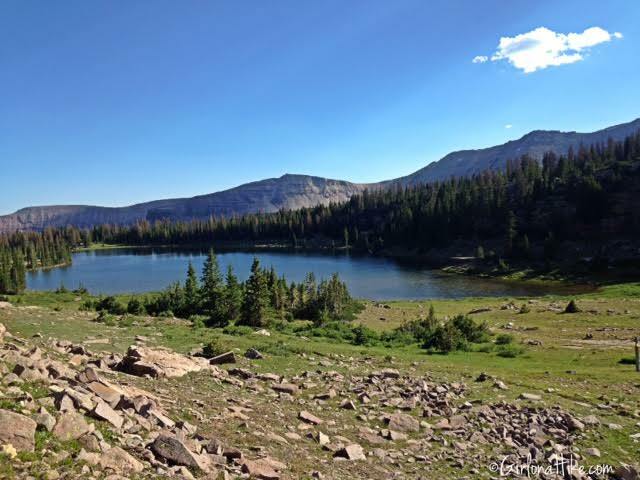 Check out my post on Backpacking to Dead Horse Lake. Charlie and I enjoying our view. More wind in the ears! Looking East on the pass. My snack selection for lunch - Thai style tuna packet (only $1 at Walmart) with Mediterranean style Triscuits! At our favorite "secret" lake. Passing by more beautiful lakes. 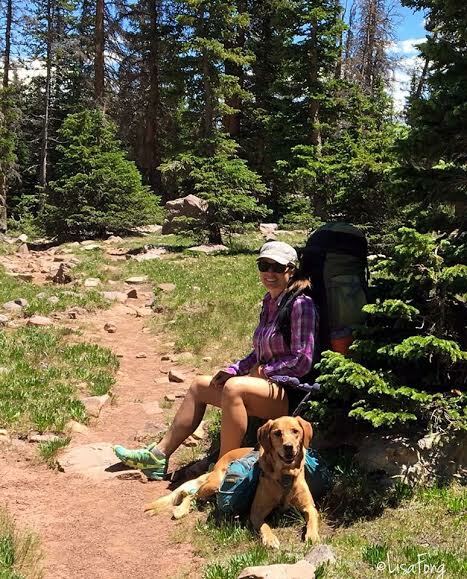 Both Charlie and I were pretty tired from our previous day hike of 20 miles, but all in all, we were happy to be back on the trail and were ready to get home. At the end of our trip, we logged 40 miles together. I can't tell you how much I cherish and love these moments and trips with him. 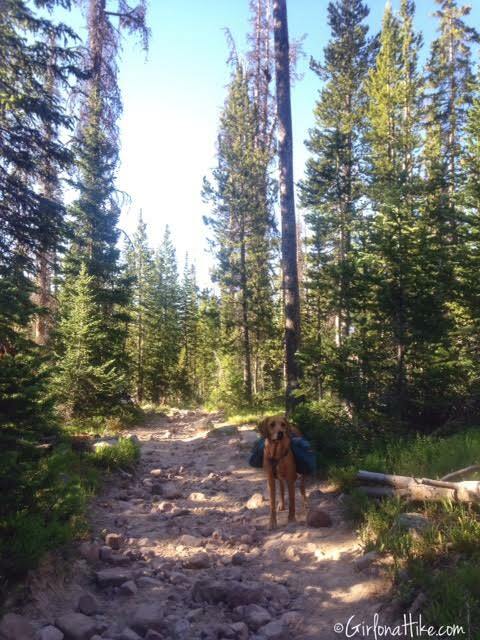 He makes the best hiking & backpacking partner out there! 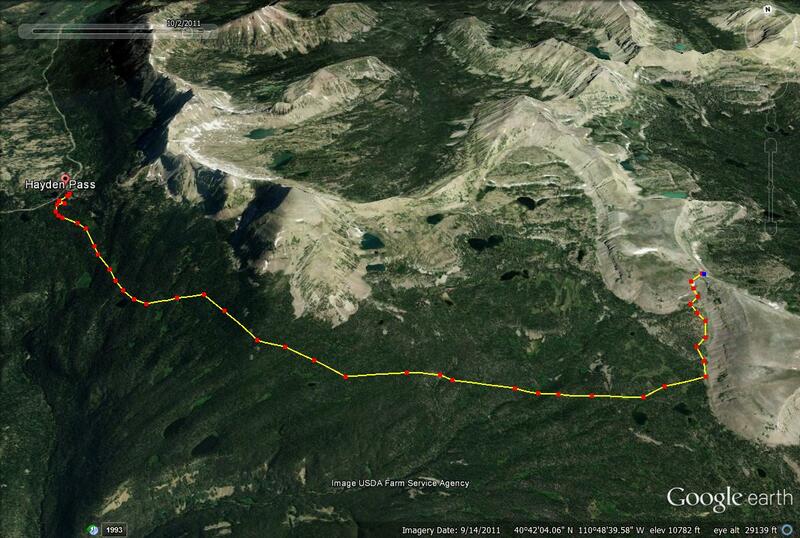 Here is a trail map from the Highline Trail at Hayden Pass to Rocky Sea Pass. Backpacking into Rock Creek Basin is up to you to explore and make your own route. 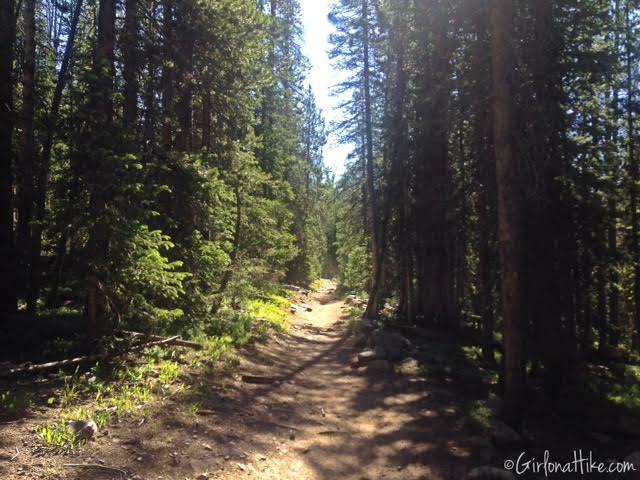 There are many trail options and all have beautiful views - you really can't go wrong with any choice! I highly recommend using the National Geographic High Uintas Wilderness Map. What a outstanding and complete write-up Alicia. Thank you for the maps, directions and product reviews/recommendations. What a great trip! 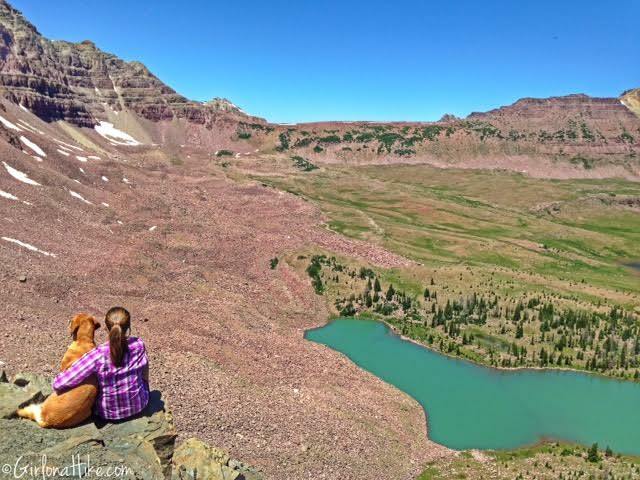 I always say the Uintas are the best kept secret of Utah- while everyone heads to the National Parks the Uintas are always amazing and dog friendly. Looks like an awesome trip! Nice trip! 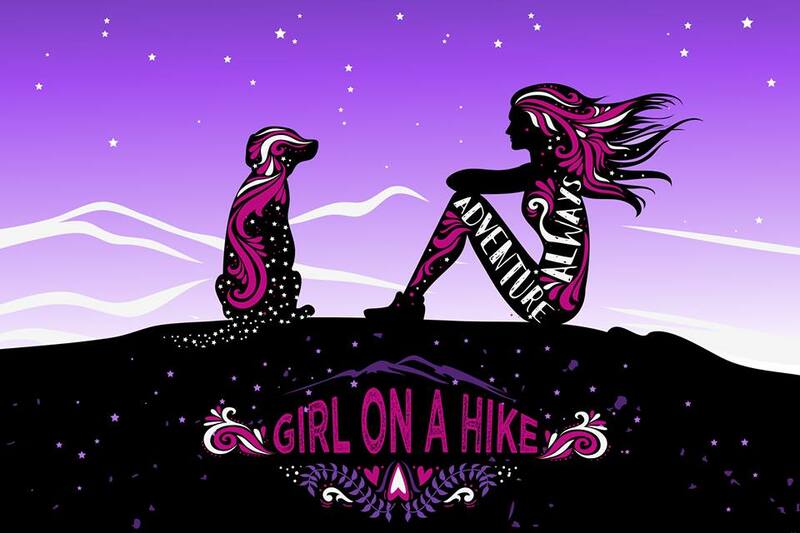 I'm getting set to travel most of the Highline Trail in a couple of weeks. 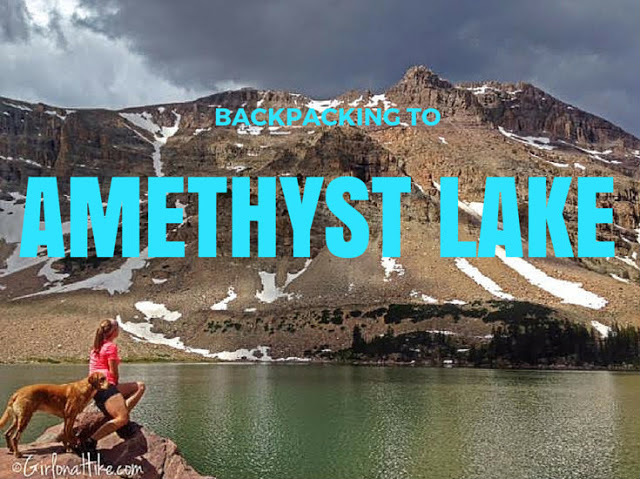 We'll be starting at White Rocks and capturing the Highline Trail at Fox Lake and then take it all the way west to Highline Trailhead. We'll be doing 6 days and 5 nights and I'm excited to finally get into Rock Creek for a night along the way, along with everything else we'll get to see. 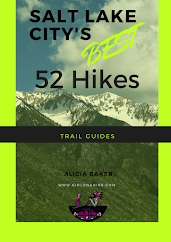 While in Rock Creek, if weather is good and we make camp soon enough, I'm hoping to see if we can't find our way up to Ostler Peak. I'll have to do some 'recon' on that favorite secret lake. ;-) And that shirt looks (and sounds) awesome by the way! Very nice! A group of 6 of us went over July 13-19th. Caught some nice fish in your "New secret" lake and many others. 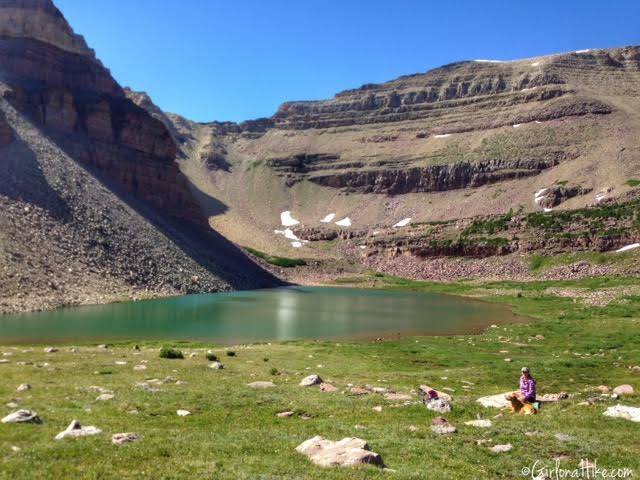 We were able to visit 13 lakes. Fantastic area! Great write up. 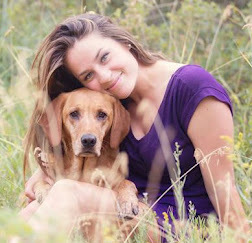 Looking forward to reading your others!